Željko Jergan is a world-renowned Croatian dance instructor, researcher, performer and choreographer. Currently based in Pennsylvania, Željko teaches at workshops, camps and festivals throughout the United States, Canada, Europe and Asia. Željko was inspired at the age of 7 to begin dancing after attending a theater performance of Croatia's state ensemble "LADO" with his father. The costumes and singing had an immediate effect on him from the moment the curtain opened and he knew he wanted to join the group. At the age of 18 that dream became a reality when he became a member of the prestigious ensemble LADO. 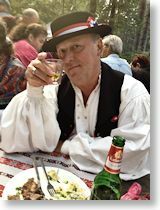 He now shares his knowledge of Croatian music, dancing, costumes and traditions with people of all ages through teaching. Explore and enjoy the website. Read Željko's biography, purchase his music and dance notations, browse the photo galleries, videos and more. Feel free to contact Željko for more information, to book a workshop or just say hello! © 2011 – 2016. Željko Jergan. All Rights Reserved.